Sue wrote to me: Hi Mike, have found your page very helpful and would appreciate your advice. There are 6 of us arriving at Málaga airport at about 8.30pm travelling to Club La Costa in Mijas Costa: Would you recommend the train to Fuengirola then the bus, or is there a better way considering the time and the size of our party and the cost? What about the Airport Express Bus, will that go past the Club La Costa bus stop or does it go out of our way? I wrote to Sue: Hi Sue, thanks for writing in. I’m glad the Gomarbella pages are useful. Yes, the Malaga Airport express bus goes directly from Malaga airport to Marbella bus station and takes the inland toll road and doesn’t stop before Marbella so you are absolutely correct about the train being the most economical way to move the group on the first part of the journey. There are three trains every hour from Malaga airport to Fuengirola train station so there is no need to hurry to the airport. 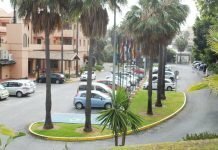 Because Club La Costa is just outside Fuengirola, if you prefer not to pull suitcases from the bus stop to Reception and save time, I suggest you take two taxis from the taxi rank right outside Fuengirola train station to Club La Costa. With all the money you’ve saved by taking the train, you can treat yourselves to this short taxi trip. If you are all still feeling fresh when you get to Fuengirola and would like keep costs down and use the bus for the last short part of the journey, walk one block to the Fuengirola bus station and take the bus to Marbella. There are two buses every hour. Ask for Club La Costa when you buy your ticket. 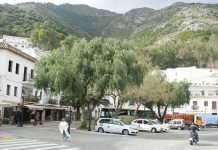 This list of the Portillo bus company bus stops between Marbella and Fuengirola will help you. The bus will trundle out through Fuengirola and then join the busy A7 coastal highway road. Almost immediately on your left you will see the Sohail castle on top of a hill. Be prepared to get off at the very next bus stop. The bus will pull off onto a service road then stop at a BP filling station. This is where you get off. 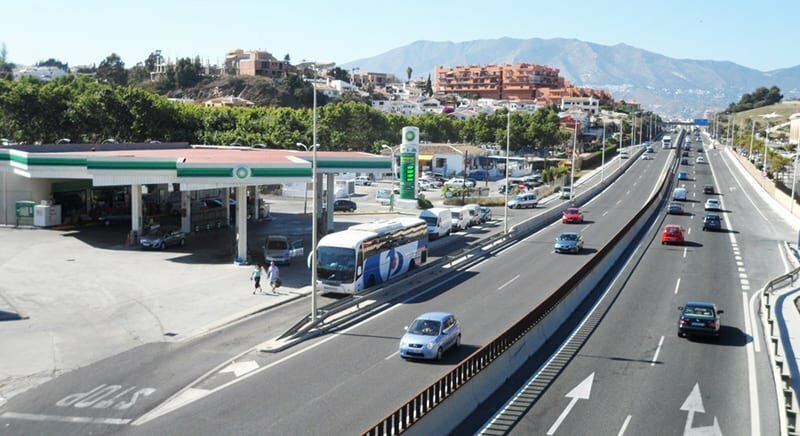 In the top photo you’ll see the Fuengirola to Marbella bus stopped at the BP filling station. 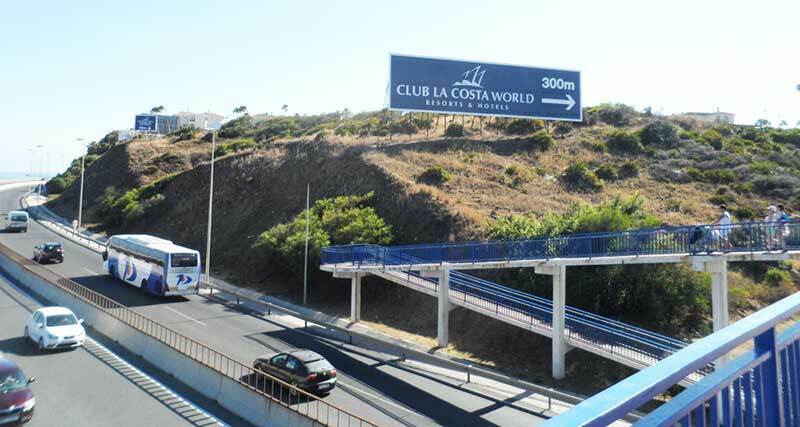 The two passengers who have just got off the bus are walking towards the footpath which follows the curve of the road inside the crash barrier for 300 metres before they leave the road and walk up to the Club La Costa Reception. In the second photo below you’ll see the same bus back on the main road heading off towards Marbella the big sign on the hill says Club La Costa 300metres but it will seem a bit further! Club La Costa WalkwayTo walk to Club La Costa you’ll need to follow the road right around the corner. If you are arriving late at night, if it’s very hot or raining or if you are pulling a suitcase, you probably won’t want to walk this far and a taxi from outside the Fuengirola train station will be the simplest. Walking from Club La Costa World to get onto the Fuengirola Paseo Maritimo, use this footbridge to cross the road to get to the Fuengirola beaches and to get to Beatriz Playa Hotel which is just over the road from the filling station below the Sohail castle. In the top photo on the extreme right you can just see the pinkish colour of the Beatriz Playa Hotel. Just behind the hotel next to the fir trees is the Sohail Castle. If you click on the top photo to make it bigger, in the background you’ll see the white buildings of Mijas Pueblo halfway up mountain behind Fuengirola. 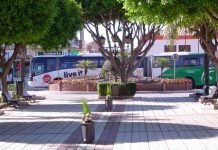 If you’d like a fun outing, you can get from Club La Costa to Mijas Pueblo by bus from Fuengirola bus station. Hi Cindy, it should be easy to go by train from Ronda to Granada, you shouldn't have to book in advance. Anyway the Renfe train website is so clunky it is not even worth trying. The bus station and train station in Ronda are quite close so you could do both the train tickets with a simple afternoon or evening walk after you have checked in. 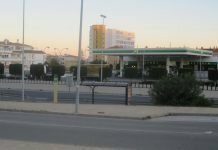 When you land in Seville, if you are taking the airport bus into Sevilla, you could also stay on the bus until the very end of the route and that is the Prado de San Sebastian bus station (about 80 metres from where you get off the bus). Sort out your onward bus tickets to Ronda then head for your hotel, by taxi best because you won't want to be pulling suitcases if it's in the very centre. Then walk up to the train station to do your tickets. Lovely place Ronda, you'll wish you were staying longer but you can always come back! Thank you Mike. We'll try to buy the bus tickets as soon as we land I Seville. We plan to spend one night in Ronda and go on to Granada the next day. It sounds like that is the heavier travel day. So I'll look into getting train tickets in advance. Do you know if that is possible? Hi Mike! I came across your page while researching my dilemma. Our party of four plans to take a public bus from Seville to Ronda on November 1, but we just realized that it's a holiday–All Saints Day– and there could be many locals traveling that day. Do you think that it will affect our ability to get bus tickets? We were planning to purchase them when we arrive in Seville a couple days prior. Is there a way to purchase securely online in advance if we need to?